Lately I’m finding it very difficult to write about cancer stuff. I sit down at my computer, feeling inspired to write a blog post or work on this “book” that I haven’t touched or really thought about in a long time. And then quickly, the motivation goes right out the door. I revert to doing work and instantly forget about whatever it was that I felt I needed to get down on paper (and by “paper” I mean “computer”… but that obviously sounds way less romantic and writer-ish). I’m not sure why this has been happening, but I think much of it is due to the fact that I am majorly cancer’d out. I have not had one day where I haven’t had to think or speak about cancer in a very long time. It is exhausting thinking and talking about such heavy things all the time. People say that eventually the day comes where you realize, “Hey, I haven’t thought about cancer in a week!” I certainly hope so. I didn’t invite it in, but there it is, and its presence is constant. I read up on the “cancer news” all the time. It might not be the best idea, but I really can’t help it. This is my universe. You might work in marketing, or finance, and you probably keep track of what is going on in those sectors so you can stay up to date and feel in the loop. Well, it is the same for me. My world just happens to be a bit less flashy and a bit less “something to talk about around the water cooler.” But I like to keep informed. I want to know what’s going on. This is my life, and my health, after all. 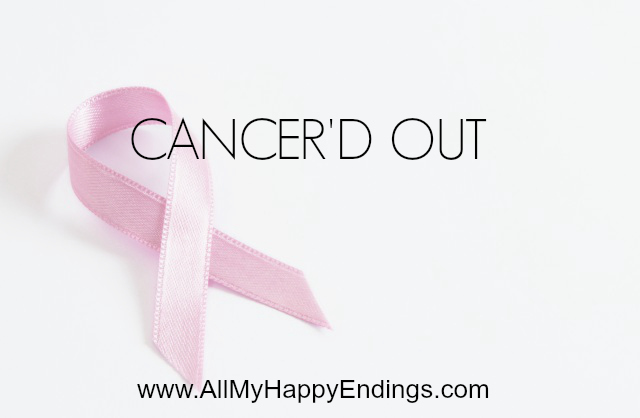 Cancer is not just something I had, or something that is in the past. It has become a huge part of my life. I used to get emails from people asking me for movie or food recommendations. Now I get emails asking for advice about lumpectomy vs mastectomy. This has become my new area of expertise. When people have a friend who is diagnosed, they send them to me. The cancer guru. The Dear Abby of planet cancer. And really, I’m okay with it. I love helping people, most of you know this about me. I like reading about clinical trials and drug advancements and understanding a very complex world that until recently, I knew very little about. I am a passionate person and I become highly invested in whatever it is I am currently working on or learning about. I am drawn to books and movies about cancer. I like talking to people about their own experiences with cancer. I suppose, like anyone, I want to feel like I belong. And as much as I want to just be a “normal” woman, thinking about things like work, weekend activities with the kids, and all that regular-people stuff… cancer is part of it, too. There it is, and there it will always be. But all that to say that sometimes, I just need a break. Sometimes I am literally so tired from thinking about it and writing about it, living and breathing it, that I need to lie down and take a nap. Sometimes I just need to turn my brain off, from the research, the statistics, the drugs, the fear, and the reality. Sometimes I just need to turn on the TV and watch the Hallmark Channel, which is pretty much the opposite of thinking about cancer.